Elderberries and Onion—and a miraculous nutrient that provides potent medicinal effects, including antioxidant, anti-inflammatory, anti-allergic and anti-viral1. Within Herbs of Gold Gut Care, Quercetin has been added for its anti-inflammatory effect, thus helping to reduce inflammation of mucosal tissue. The Herbal Medicines contained within Herbs of Gold Gut Care, such as Aloe vera, Slippery elm powder, Calendula and Licorice root contain a natural phytochemical called mucilage. Mucilage is responsible for the demulcent effects of herbs, which essentially means that it binds to mucosal surfaces and protects them from damage, thus allowing them to heal faster. This damage may come from stomach acids or dietary acids and irritants. This demulcent effect is particularly important for those suffering with gastroesophageal reflux disease, as the esophagus—which is not equiped to handle the harsh acids of the stomach—can become inflammed and quite painful. However, other conditions such as gastritis will also benefit from a good helping of mucilage. 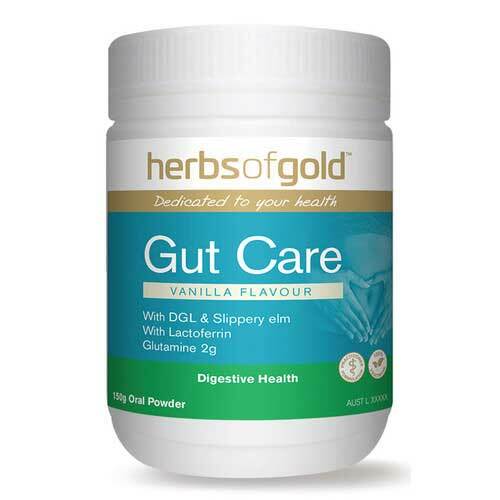 Herbs of Gold Gut Care also contains L-Glutamine, Zinc and Bovine Colostrum. Glutamine is a conditionally essential amino acid that support integrity of intestinal cells, while zinc is an excellent facilitator of tissue healing of all types, whether it be skin (such as stretch marks) or the stomach2. Adults and Children over 12 years of age: Mix one level scoop (5g) into 150ml water or juice, once daily, taken with food.